The following steps are used to generate vegetation such as trees and grass on the basis of landcover data available. 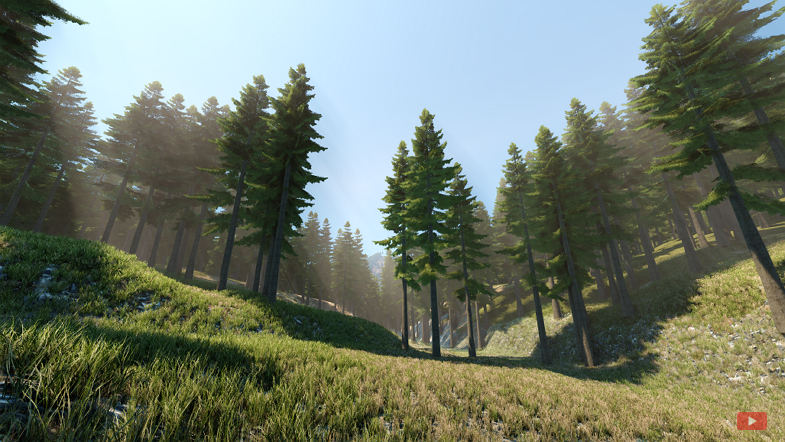 Watch the dedicated video tutorial to get familiar with vegetation generation. Create a basic object of the desired type. Specify parameters of the basic object in the Parameters window. Intersections with parent object must be enabled for all types of basic objects. The intersection flag can be found on the tab of the Parameters window corresponding to the type of the object. Inherit a material, set all necessary textures and parameters and assign it to the basic object. The Landscape Tool generates R8 textures to be used as masks for Grass objects. Therefore, you need to prepare a grass node with a corresponding diffuse texture, containing 1 vertical column of grass chunks, in its material. Export your node to a .node file (e.g. grass.node) and then delete the node from the world. 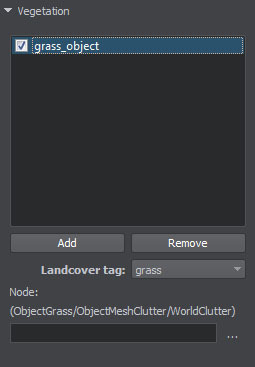 Now our basic object for grass (grass.node) is ready to use and you can delete it from the scene. Now, we add a landcover data source to be used for generation. If the data source is already added, you may skip to step 3. R8 and RGB8 mask textures are supported. 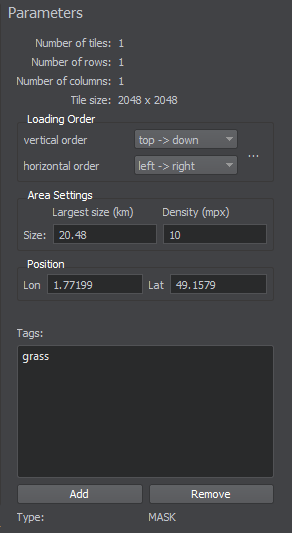 Add tags for each type of landcover objects you are going to generate by clicking Add button at the bottom of the Parameters panel and specifying a tag name. To remove a tag use Remove button. For an R8 texture data source - by setting the range of bits (from value, to value) to be treated as a certain type of vegetation. 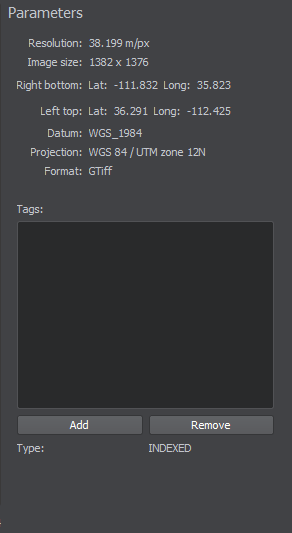 For an RGBA8 texture data source - by selecting a base color and setting threshold value for a color gradient to be treated as a certain type of vegetation. 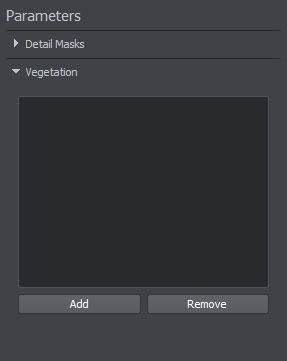 On the Sources panel, select the Masks (Landcover) data source type and the following settings will be displayed in the Vegetation tab of the Parameters panel. Add a basic object for generation by clicking Add button and specify object's name. You can add as many objects as nesessary. The tag for the selected landcover object from the list of tags specified at the second step. If you are going to update some of the existing vegetation objects, check only the changed ones. At that, the other objects will remain the same after terrain generation. If the terrain is already generated and you want to add or change only vegetation - proceed to Step 4. Now you can generate vegetation by clicking Generate button and selecting Landcover objects option in the Steps window, in this case only landcover objects will be generated. Here is a terrain fragment with vegetation generated on the basis of landcover data using the basic Mesh Clutter object for close trees and the Grass object for tree impostors on far distances. To regenerate some of the existing vegetation objects, check only those objects that should be updated, click Generate and select Landcover objects option. Only the specified vegetation objects will be regenerated. At that, the other ones (that haven't been checked) will remain the same.